It is our nearest star system - and holds huge potential for find life. Now, a NASA team has revealed it has started planning for a mission to Alpha Centauri - and hope it could blast off on the 100th anniversary of Apollo 11 in 2069. However, there is one slight issue - the team say most of the technology they need to get there doesn't exist yet. 'It's very nebulous,' Anthony Freeman at JPL, who presented the mission concept at the 2017 American Geophysical Union conference in New Orleans, Louisiana, on 12 December, told New Scientist. A 2016 US funding bill told NASA to study interstellar travel that could reach at least 10 per cent of the speed of light by 2069. It also directed the agency to launch a mission to Alpha Centauri, the nearest star system to ours. Currently only one human-made spacecraft has left our solar system—Voyager 1, which launched 40 years ago and is currently traveling at about 38,000 miles per hour, less than 1 percent of 1 percent of the speed of light. The team say the probe's primary goal will be to determine whether life is present. It will scan for artificial structures, lights going on and off, and large-scale land modification. However, the team still has to work out how to get the probe there. Alpha Centauri is 4.4 light-years away, or nearly 40 trillion kilometers - and the fastest spacecraft so far launched into space, the NASA-Germany Helios probes, traveled at 250,000 kilometers per hour. At that speed, it would take the probes 18,000 years to reach the nearest star to the sun. To get there spacecraft will need to travel a substantial fraction of light-speed—10% would get a craft to Alpha Centauri in 44 years. The JPL team has not yet worked out how to power the craft - and many of their ideas rely on technology that doesn't yet exist. To get there in anywhere close to a human lifetime, spacecraft will need to travel a substantial fraction of light-speed—10% would get a craft to Alpha Centauri in 44 years. To do this, researchers are investigating a range of technologies, from laser powered 'light sails' to advanced nuclear propulsion systems, including one called a Bussard ramjet, which uses electromagnetic fields to scoop up hydrogen from the interstellar medium as it travels along, compressing it sufficiently for nuclear fusion to occur, providing thrust to drive the craft forward. 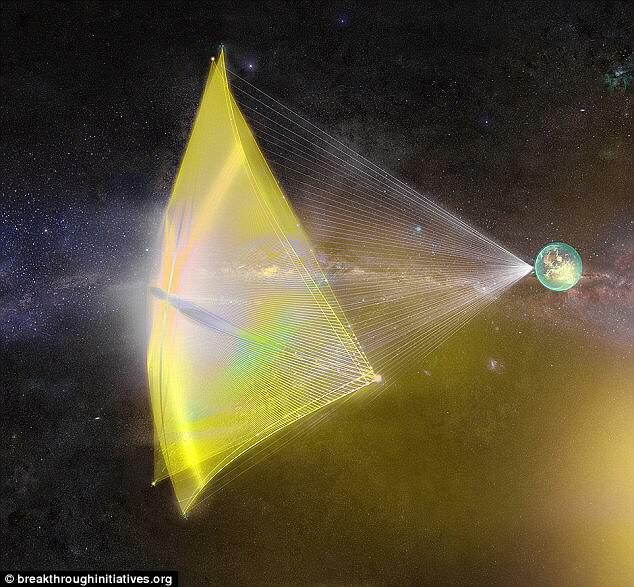 For light sails, a ground-based light beamer would push ultra-light nanocrafts – miniature space probes attached to lightsails – to speeds of up to 100 million miles an hour - a technolgoy also being developed by the Breakthrough project. The JPL group has already drafted science goals for the mission, including studying the make-up of the matter and radiation it encounters, and testing general relativity on the way. It will first make observations of the planetary system, the atmosphere and landscape of the target exoplanet. 'We'll be able to characterise the atmosphere. We'll be able to see the planet, assuming it's not covered in clouds,' JPL's Stacy Weinstein-Weiss, lead author of the paper outlining the concept, told New Scientist. The current plan calls for NASA to send a large telescope to deep space were it would position itself so that light from Alpha Centauri grazes our sun, using a technique called gravitational lensing can give us a full view of the exoplanet. NASA is also considering targets other than Alpha Centauri. However, recent research has said our solar system's nearest neighbour could be home to small, rocky planets much like Earth, according to a new study. A new analysis of the nearby Alpha Centauri system has revealed there may not be as many larger planets orbiting the two main stars as previously thought – instead, small, Earth-like planets are likely the most common kind. According to the researchers, the new understanding could help to narrow down the search for habitable worlds just 4.4 light years away. The Alpha Centauri star system is 25 trillion miles (4.37 light years) away. With today's fastest spacecraft, it would take about 30,000 years to get there. Breakthrough Starshot aims to establish whether a gram-scale nanocraft, on a sail pushed by a light beam, can fly over a thousand times faster. 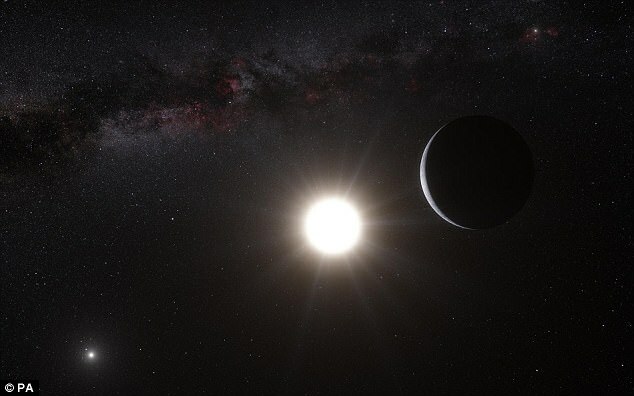 Astronomers estimate that there is a reasonable chance of an Earth-like planet existing in the 'habitable zones' of Alpha Centauri's three-star system. The new study led by a team of Yale astronomers rules out the existence of a number of larger planets in the system. While these larger planets were previously predicted in other models, data from more advanced spectrographic instruments suggests a different scenario may be at play. 'The universe has told us the most common types of planets are small planets, and our study shows these are exactly the ones that are most likely to be orbiting Alpha Centauri A and B,' said leading exoplanet researcher, Professor Debra Fischer. Alpha Centauri sits just 24.9 trillion miles away, or about 4.4 billion light-years, and is the closest solar system to our own. It's home to three stars: Centauri A, Centauri B, and Proxima Centauri. 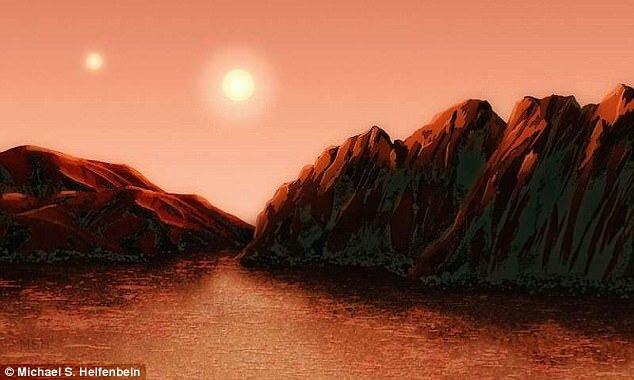 And, just last year, scientists revealed they'd spotted an Earth-like planet circling Proxima Centauri. The project involves deploying thousands of tiny spacecraft to travel to our nearest star system and send back pictures. If successful, scientists could determine if Alpha Centauri, a star system about 25 trillion miles away, contains an Earth-like planet. The catch: It could take years to develop the project, dubbed Breakthrough Starshot, and there is no guarantee it will work. The small light-propelled vehicles will carry equipment like cameras and communication equipment. This involves a ground-based light beamer pushing ultra-light nanocrafts – miniature space probes attached to lightsails – to speeds of up to 100 million miles an hour. Such a system would allow a flyby mission to reach Alpha Centauri in just over 20 years from launch. Scientists hope the vehicles, known as nanocraft, will eventually fly at 20 per cent of the speed of lightt. He envisions sending a larger conventional spacecraft containing thousands of nanocraft into orbit, and then launching the nanocraft. If they reach the star system and succeed in taking photographs, it would take about another four years to transmit them back. 'Because Alpha Centauri is so close, it is our first stop outside our solar system,' Fischer said. In the new study, the team looked at data from a new wave of instruments in Chile, including the spectrograph CHIRON, which was built by Fischer's team, HARPS, and UVES, part of the Very Large Telescope Array. 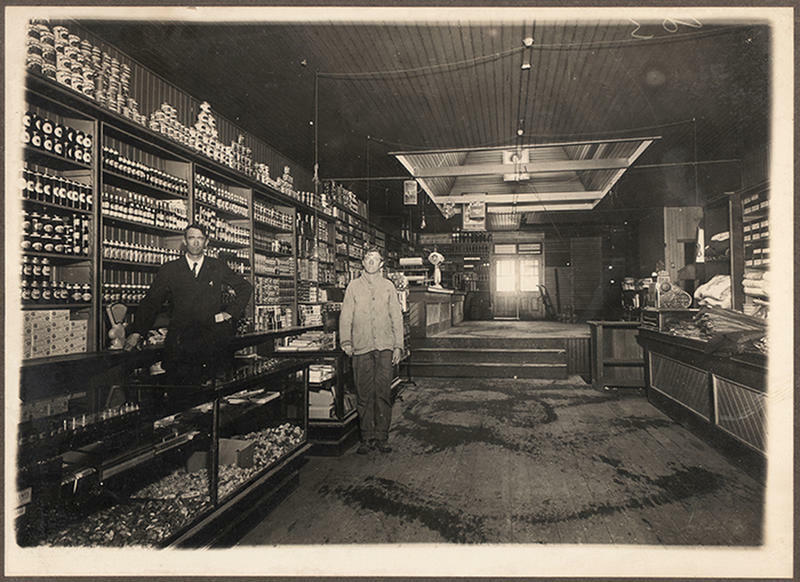 'The precision of our instruments hasn't been good enough, until now,' Fischer said. According to the researchers, small, rocky planets would have gone undetected in spectrographic analysis. This means there could be planets smaller than 50 Earth masses that were overlooked, orbiting Alpha Centauri A. And, there could be orbiting planets smaller than 8 Earth masses orbiting Alpha Centauri B. Around Proxima Centauri, there may be orbiting planets that are less than one-half Earth's mass. The new study also eliminated the possibility of large, Jupiter-sized planets that could give rise to asteroids and alter the orbits of smaller planets, the researchers say. 'This is a very green study in that it recycles existing data to draw new conclusions,' said first author Lily Zhao.